The heat on the street in Greece is rising towards red-hot as the social democratic PASOK government moves towards harsh austerity measures to save rich financiers from their own crisis. Major cities in Greece are starting to see semi-spontaneous convulsions from below. These are the type of mass actions which just might turn into popular insurrection. So the geopolitical stakes are being raised in tandem with the escalating anger on the streets of Greece. Citizens of Portugal, Spain, Italy, Britain and other European countries on the brink of financial crisis will be following Greek events very closely. They know their own governments are leaning towards austerity measures to bail out the bankers. 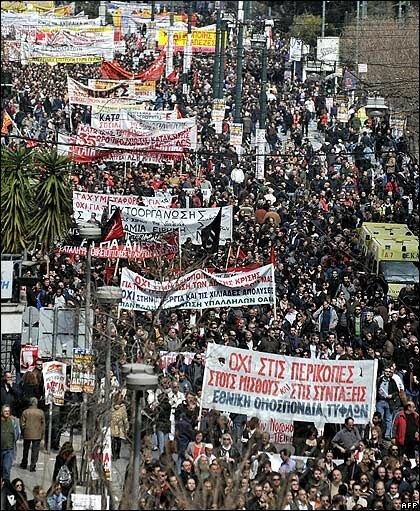 Many European states have already seen mass protests and strikes by workers, students and other grassroots folk over recent months. The mass convulsions in Greece, and the upswing of popular protest across other European states, are signs that the social contagion is spreading at a fast rate across rich countries as well as poor ones. Here, in far-away New Zealand, most people may think such events are a foreign phenomenon. Yet Kiwis are facing a rise in GST to 15%, which will blow many family budgets to bits so that the rich can be awarded massive tax breaks. Financialisation, the central pillar of neoliberal capitalism, has been driving government measures which soak the poor in order to bail out financial speculators. New Zealand is no exception, as we will see from the National-led government’s tax changes on 20 May that blatantly favour the wealthiest few percent at the expense of everyone else. What we need in New Zealand is a popular campaign to roll back financialisation. Watch this space for more news about what we can do!